Despite High Poll Numbers, Obama Still has Work to do in Order to Win the Support of Latinos. The latest polls released suggest that Barack Obama has made great strides in wining the favor of Latinos who voted for Hillary Clinton during the primaries earlier this year. In a recent poll by the Pew Hispanic Center, Latinos are overwhelmingly supporting Senator Barack Obama for president 66 percent to 23 percent for Sen. Spell out John McCain. This is good news for many Democrats who feared that disappointed Hillary Clinton supporters would not support Obama and might even support McCain. However, it seems that Obama still may have some work to do when it comes to Hillary Clinton’s most devoted supporters. But it seems perhaps not all of Hillary Clinton’s supporters are quite ready to show their full support for Obama. De La Paz Torres also says she is not sure she can vote for Obama, “he’s not experienced enough for him to handle the presidential decisions right now. I feel that he should have waited.” Other fellow Texans such as Blanche Darley have similar sentiments. She explained that she does not trust Obama and does not think he has paid enough attention the needs of the Mexican-American community. Rocha continues on to say that perhaps winning over die hard supporters such as these will be Obama’s biggest challenge. He believes Obama has a lot of work to do to win over many Clinton supporters, especially low-income, Latino and women voters. “What Obama says at the convention and how he says it,” Rocha said, “will be critical in his bid to woo them.” In a year where many Latino votes will come from swing states where every vote will be crucial towards choosing the next president, facing this challenge is of utmost significance to Obama and the Democratic Party. The amount of attention that has gathered around the Latino vote is translating into financial gains for Spanish-language media. Both Barack Obama and John McCain are expected to make huge media buys beginning in the month of August and throughout the election in November. The majority of these media buys will be concentrated in swing states with significant Latino populations. “We are significant players in the battleground states,” said Philip Wilkinson, chief operating officer of Entravision Communications Corp., owner of 51 Spanish-language television stations. Executives of Spanish-language stations have plenty to be excited about, since according to Lloyd Walmsley, an analyst in San Francisco with Thomas Weisel Partners, Entravision’s political ad sales will double to $12 million from the last presidential cycle. Another power player in Latino media Univision expects to take in as much as $20 million in political ads in the second half of 2008, according to Chief Financial Officer Andrew Hobson. That would represent a full-year gain of as much as 78% from 2004. Television station Azteca America, owned by Mexico City-based TV Azteca, almost doubled its political ad sales from 2004 during the primaries, and projects similar gains in the general election, said Brian McCullough, director of spot TV sales in New York. Telemundo, which as owned by General Electric Co.’s NBC Universal, also enjoyed record primary spending, according to Enrique Perez, Senior Vice President of Sales. These financial gains for Latino media companies may be a reflection of the increased clout Latinos have in presidential politics. Perhaps, the most significant gain of all is the fact that campaigns are actively pursuing Latinos both in English and Spanish. It remains to be seen whether that interest will be long-lasting or if it is just a phenomenon of the 2008 election. The Year of the Latino? In 2004 George W. Bush made headlines when he was able to gain forty percent of the Latino vote since Latinos traditionally vote for the Democratic candidates. This percentage is also significant when we consider that Latinos make up a large bloc of voters in four key states that George W. Bush carried by fewer than 5 percentage points in 2004. They comprise 37 percent of the eligible electorate in New Mexico, 14 percent in Florida, 12 percent in Colorado and 12 percent in Nevada. These states will also play a key role in this years coming election. Every election promises to be a historic one for Latinos. The reality is that the number of Latinos involved in the electoral process has been steadily increasing in the past years. US Census data reveals that between the presidential elections of 1988 and 2004, the Latino vote doubled. This election promises to be just as close as the last one. Except this year Latinos seem to be more motivated to come to the polls. The immigrant backlash that has emerged in recent years has certainly motivated some in the Latino community to register to vote and become more involved in the political process. The polls have been influenced by the Bush administration’s new high-profile crackdown on illegal immigrants, featured nightly on Spanish-language news. Most recently, many have not forgotten the images from Pottsville, Iowa where Immigration and Customs Enforcement (ICE) officers detained approximately 300 individuals at Meatpacking Company. Members of the Congressional Hispanic Caucus, Congressmen Luis Gutierrez (D-Ill) and Congressmen Joe Baca (D-Ca) visited the site after the raid and said “this is a firsthand example of how a broken Immigration system devastates a small town.” This could be the reason why Latinos polled by the Pew Hispanic Center said Democrats are doing a better job of dealing with illegal immigration, and by 44 to 8 percent Latinos say Democrats are the party with more concern for Latinos. Due to our electoral process, the presidency is determined by a small number of states. The presence of Latinos in some of these swing states and their motivation to be involved in the process due to the significance of the immigration issue may mean that we will achieve a higher voter turnout this election cycle. According to the Census, 7.5 million Latinos voted in the 2004 election. The goal of Latino organizations this year is to increase that number to 10 million. If this goal is met this year, perhaps this might be the year of the Latino. Expert argues that Hispanics require more than ads and posters in order to be engaged in the political process. This year the media has focused heavily on the importance the Hispanic vote will have in presidential elections. As a result more than ever before we have seen both candidates invest money and efforts into gathering support from the Latino community. Most recently, the Democratic National Committee and Barack Obama announced a 20 million dollar spending plan to invest in outreach to Hispanics voters. 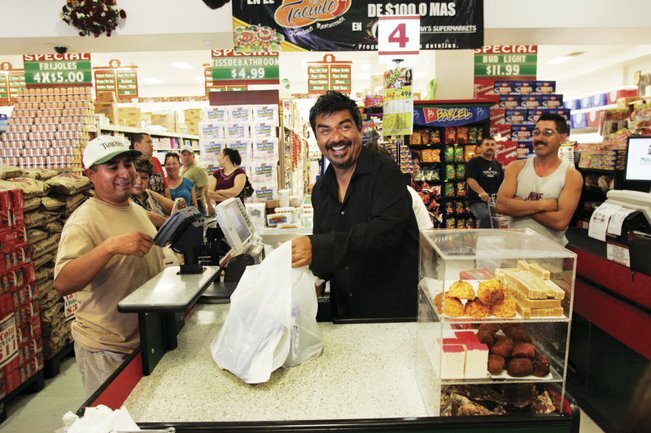 An example of this is the recent appearance of comedian George Lopez at a Las Vegas supermarket. During his visit he engaged patrons about why Hispanics should come out in support of Barack Obama in November. This appearance was met with strong enthusiasm. Mostly he was being himself, with his people. At one point, he turned to no one in particular and said, “This is it. This store is so powerful.” And the feeling was mutual: He beamed at the people and they beamed back. It seems that perhaps Barack Obama’s campaign has received that message. It remains to be seen whether John McCain’s campaign will soon follow this example. Segal concluded that “time and shoe leather” is what candidates really need if they want to make inroads with Hispanics this November. The Fight For Latino Votes Goes West…the Midwest that Is. As reported last week recent data from the US Census Bureau revealed that the Latino population is growing at a rapid rate. The data also revealed that the population growth is occurring not only in states were Latinos tend to be concentrated such as California and Texas but is spreading to Midwest states. During this election year several of those states such as Wisconsin and Ohio are considered battle ground states where every vote will be of utmost significance. Presidential candidates have taken notice of the changing demographics and are taking steps to woo Latino voters in this region. Senator Barack Obama’s campaign and The Democratic National Committee recently announced a 20 million dollar spending plan which will focus on Latinos. They plan to invest money in states such as Wisconsin and Ohio. In fact his camp has plans to open up several offices in the southern part of Wisconsin where the highest concentration of Latinos resides. McCain, for his part, also has said he plans to seek Hispanic votes outside of the traditional states. Both the Obama and McCain camps have been working with Latino publications such as Milwaukee’s “El Conquistador” and other Latino media throughout the state in an effort to spread their messages. The Hispanic population of Wisconsin may seem small in comparison to that of states such as California. But when the stakes are high, any small margin can make a difference. Charles Franklin, a political scientist at the University of Wisconsin-Madison explains, “Almost any group, no matter how small, could be pivotal.” This becomes even more significant when one considers that in 2004 Hispanics made up about 1.8 % of voters in Wisconsin and John Kerry lost the state of Wisconsin by only 1%. Should Colleges Enroll Illegal Immigrants? There are thousands of undocumented students who upon graduating high school face great uncertainty and obstacles if they choose to pursue a higher education. The federal government’s failure to take any action on the immigration issue, has forced states to take matters into their own hands. Certain states like California, allow undocumented students to attend public universities and pay in-state resident tuition fees. However, other states in the nation have taken different measures. Most recently, South Carolina became the first state in the nation to ban undocumented students from attending public colleges and universities. Meanwhile, states like California that have allowed undocumented students to attend their higher learning institutions now face pressure and even lawsuits to repeal in-state tuition benefits for illegal immigrants. Estimates released by the Census Bureau today reveal that the Latino population is increasing at a rapid rate in the United States. The Latino population is also significantly younger than the rest of the population. These demographic shifts will have a great impact in the political landscape of the US….